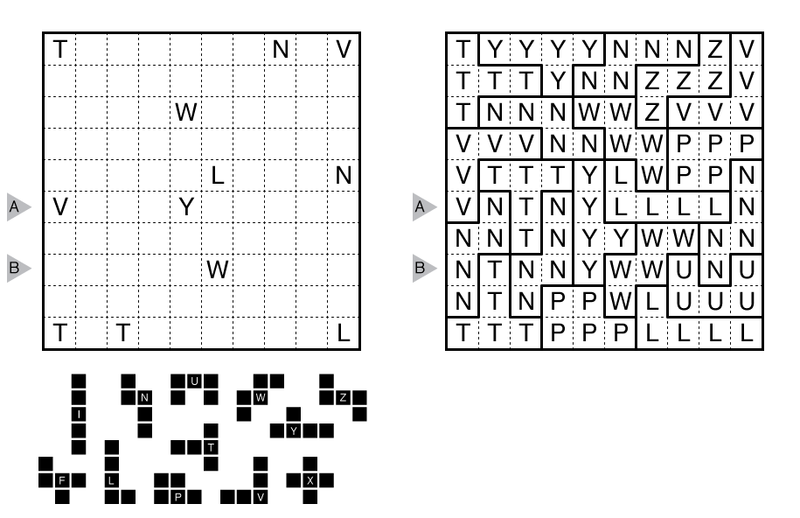 Rules: Divide the grid into pentominoes (five-cell regions) so that no two pentominoes of the same shape (including rotations/reflections) share an edge. A cell with a letter in it must be part of the pentomino shape normally associated with that letter. An inventory of pentominoes is given below the puzzle but not all shapes must be used. Answer String: Enter the letter associated with the pentomino occupying each cell in the marked rows/columns from left to right/top to bottom, separating the groups with a comma. Use CAPITAL LETTERS! This example has the key “VNTNYLLLLN,NTNNYWWUNU”. (Brief) History of Pentominous: Combination of Pentomino shapes and Fillomino. This puzzle style was created by Grant Fikes in 2013 and first appeared here at GMPuzzles. The name is a portmanteau of Pentominoes and Polyominous, the latter being the name, originally suggested by Adam R. Wood, that Grant used on his own puzzle blog for Fillomino puzzles. History of this example: This symmetric Pentominous puzzle was written by Grant Fikes as his 96th contribution on this website. Sources for Pentominous Puzzles: Follow this link for classic Pentominous puzzles on this website and this link for variations on Pentominous. If you are new to this puzzle type, here are our easiest Pentominous to get started on. More Pentominous can be found in Plenty o’ Pentominous by Grant Fikes and Murat Can Tonta and in our beginner-friendly collection Intro to GMPuzzles by Serkan Yürekli. Design rules for contributors: A Grandmaster Pentominous will have a unique solution that can be reached by logic alone. Generally, a Grandmaster Pentominous should have an interesting solution realized through clever positioning of given clues. In addition to logical themes, symmetric and word-based themes are also common. Sizes from 10×10 and above are recommended (maximum aspect ratio of 2:1 if rectangular).